Break of dawn. A flock of white birds has settled on the grass. But – they are not moving! 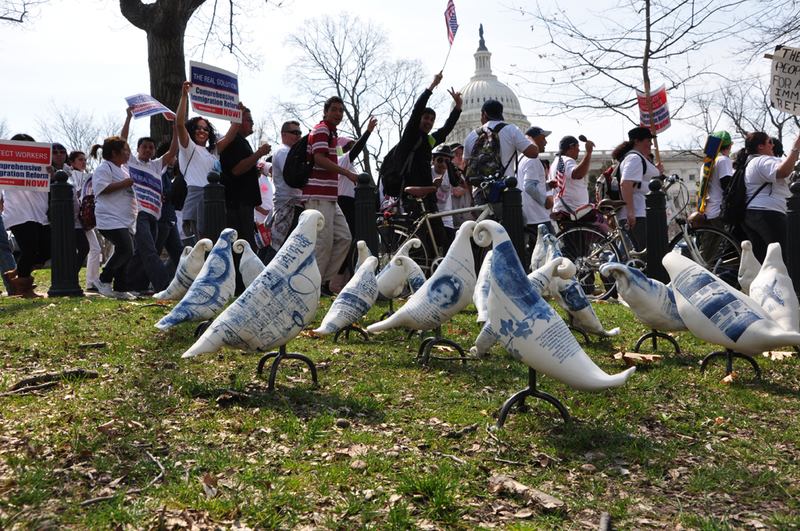 Getting closer you see, despite their birdlike gestures, they are made of porcelain. On their backs they have blue writing and pictures: images of children playing, love letters, recipes and poetry, layered with photographs, stories and clippings about war. Wherever the birds show up, they lead people to read, think and talk. Passer-bys are drawn in by the peaceful scene. Looking more closely, they find snippets of human culture; fragments of a mirror that reflect some of our deepest connections, and also the unthinkable ways in which those bonds are disregarded. Sometimes people get interested to know “who has put these birds here”, “how they are made” and “why”? It turns out the artist is there, and all kinds of discussions occur. At sunset the flock disappears only to resurface somewhere else: on a beach in San Diego, in front of the US Capitol in Washington DC, at Chartres Cathedral in France, outside the UN Headquarters in NY, at a port in the Galapagos Islands, or at the park down the street. Starting locally and then flying increasingly further afield, the project develops organically through contact with people in everyday places. As the content on the birds evolves, the artist also turns to her own family history concerning WWII. During that time her grandfather was a German scientist as part of Wernher von Braun’s group, working on the V-1 flying bomb and V-2 rocket for Hitler in an isolated place up on the Baltic Sea called Peenemünde. Consequently one of the most interesting and personally meaningful bird landing locations is Peenemünde, attended by her father, who lived there as a child. Traveling for two years and landing in over 60 locations internationally, the birds continue to explore new places and meet new people, each time a different experience. What excites us most about this public art project is that it inspires passer-bys to talk to each other. Questions arise like “What is peace and what is war?” “What is public art” or “Can art achieve anything?” Very different people share their own experiences, exchange their thoughts and come away inspired and with more consideration for our conflict-fraught world. This documentary collects those personal experiences, preserves some of the conversations and hopefully encourages more conversations to happen. Two main threads lead us through the film. On the one hand there is the making of the birds and how they and their messages develop. On the other hand the film follows some of the most important bird landings. Two of them are Los Alamos and Peenemünde, curious parallels. They were each the sites during WWII where the “secret weapon” that was meant to win the war was being developed. A lot of people have contributed to the film, in critique and feedback sessions, and in direct material used. Henry Shukman gives a reading in the film of his poem Snowy Morning which appears on some of the birds. Helmut Hillenkamp, who attended most of the landings, contributed footage of some of the exotic ones like Galapagos Islands or Chartres Cathedral in France. Genevieve Russell collected documentary material at the “Heart of Power” in Washington. The musicians around Ibrahimasory “Soriba” Fofana (Soleil d’Afrique) composed and played music specifically in response to action and mood for the film. The documentary is the result of a successful collective effort. The documentary is the result of a successful collective effort. A lot of people have contributed to the film, in critique and feedback sessions, and in direct material used. A big thankyou to you all! Henry Shukman gives a reading in the film of his poem which appears on some of the birds. Helmut Hillenkamp, who attended most of the landings, contributed footage of some of the exotic ones like Galapagos Islands or Chartres Cathedral in France. Genevieve Russell collected documentary material at the “Heart of Power” in Washington. The musicians around Ibrahimasory “Soriba” Fofana (Soleil d'Afrique) composed and played music specifically in response to action and mood for the film.